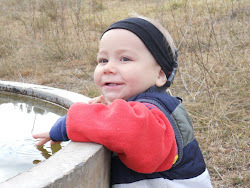 We have now reached a special milestone- one year of hearing for Henry. Two years ago I was about to give birth to my second baby, and I had no idea of the journey I was about to embark on. Adapting to life with two children. Getting to know my little baby boy. And learning all about deafness and what that means. Today I have two gorgeous children, both with their unique strengths and weaknesses. We will continue to meet challenges as they arise, for both children as they grow older and more independent. We know we will have issues to deal with regarding Henry’s deafness, alongside many other issues we will face being parents - that’s life and that’s what makes it interesting. Will is way more concerned about Imogen becoming a teenager and wanting to go out with boys than he is about Henry growing up! Henry is fast approaching 200 words. I am not so interested in his word count except that it is something quantifiable, something easy to measure. It is the more abstract things that I am most proud of. The sociable, little person that he has become (so different to the quiet, reserved, frustrated little baby we used to have). The way we have adjusted to Henry’s CI’s being part of our family life. Auditory-Verbal Therapy techniques have infiltrated our everyday interactions, and Imogen is as good as any of us. Henry has begun telling us when his coil comes off, and I look forward to him taking more responsibility for his CIs. I have developed some unusual quirks, like forgetting that babies wake up to loud noises, I am so used to Henry sleeping through anything. Most days pass and we barely think about Henry’s hearing loss. Putting his CIs on in the morning is as second nature as changing his nappy and getting him dressed. Our family and friends are great at replacing a coil if it comes off, but I think most of them don’t think about it either. Last week when I was dropping Imogen off at school, one of the ‘tough’ boys from her class came up to Henry and said in a disparaging tone, what is that on his head? I let Imogen answer, since the question was directed at her. Trying to tie her hat on with one hand, while simultaneously jumping up and down (as only four year olds can!) and pointing to Henry’s CIs with the other hand, she said flippantly, they’re Henry’s CIs- see without these he can’t hear. Oh, cool, said the other boy, and they ran off to the playground together, with Henry chasing after them. Soon it will be Henry being asked these questions, and I look forward to a similar offhand reply. A year ago we still weren’t sure if Henry had any other additional issues with development. We just kept trying to do our best for him and knew that whatever happened it would be okay. A year on, we think less about issues like that, and more about the general day-to-day toddler issues. Like not knowing whether to laugh or cry when you present him with a lovingly made dinner and he promptly declares “No... Bin!” But having been through this past year has certainly taught us to take nothing for granted. The fact that Henry can run and kick a ball, besides being extremely cute, is something that lifts my heart every time. It wasn’t a given that he would be able to do that. Every achievement, every skill he has developed, I feel thankful for. I know that many parents don’t have it as easy as us. I never forget this, and they have my admiration and appreciation every day. It is truly amazing the strength and courage that can be mustered for the love of a child. This will be my last blog post. We have been through an amazing journey this past year, and it has been special to be able to share this journey with all of you through my blog. I will be forever grateful for the support that has been offered to our family from other parents, professionals who have become friends, and our family and friends. Thank you. Sarah, William, Imogen and Henry. 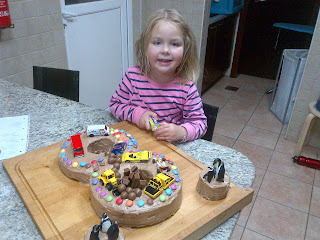 Imogen with the cake she decorated for "Happy Henry's CIs Birthday"
Henry’s journey has been fantastic. He has gone from being profoundly deaf, locked in his own world, unable to communicate and participate fully in our life, to a very happy, outgoing and confident little boy. He can hear the word “biscuit” whispered in the other room, and will throw a huge tantrum, demanding his “mama” or “dada” listen to his needs. This ends in two ways, a biscuit and a “thank you” from our little boy. Or a distraction by us with the promise of something equally good- a book, bike ride or one of his cars (all of which he will eagerly say “yes” to, nodding his head up and down and understanding completely what we are offering). What wonderful progress he has made. But, how has my journey tracked? I was a reluctant participant in all of this. You know the quote “I took the road less travelled”. That wasn’t my choice. I wanted the road most travelled. I wanted a normal, healthy baby. I didn’t want a baby who was profoundly deaf. Sure, I am ‘technical’, I studied engineering at university. But I didn’t want to learn about audiology. I was quite happy to never know the difference between conductive hearing loss and sensorineural hearing loss. Yes, I enjoy studying, but do I have to learn Auditory Verbal Therapy? I have been put on a path that I wasn’t prepared for. That I didn’t choose. But you know what? I am a mother, I am Henry’s mother and that means embracing every aspect of that. I am privileged to be the mother of two gorgeous children, and I love all that comes with it. Parts of the journey have been hard. Holding Henry in my arms as they knocked him out to commence a seven hour surgery to implant his cochlear implants- what an enormous responsibility; as he looked up at me with his trusting eyes, me worrying if we were doing the right thing, but sure that we had made the best decision we could. I feel so special to be part of Henry’s journey. It has been Henry’s journey towards hearing and talking, but it has also been my journey. I have learnt so much- the technical stuff is easy, I can learn that in a night. But the important stuff, you have to experience it, to live through it. I have developed a greater understanding of love, acceptance, family, empathy and resilience. Not just through my own journey, but through other people I have been lucky enough to meet and talk to on the way. And you know what, I feel proud of how I got through this. And I really do feel we are ‘through it’. Henry may not have ‘normal’ speech and language yet, but I have no doubt that he is well on the way. I have no concerns whatsoever about his language development now. Sure there will be things to sort through in the future, but just as part of normal everyday life. I am constantly reminded that every day parents are faced with the discovery that their child has hearing loss. And it’s a traumatic and troubling time, it definitely is. Filled with uncertainty and unknowing. But if I can offer any comfort, it is this: I have kept my blog for ten months now, on our journey towards getting Henry access to sound and hoping that he would one day speak. Although the odds are good, you never know... And so I recorded our journey, the ups and downs, the exciting moments, the difficulties. But less than one year on, I find I have little to write about. And I am starting to feel, it’s no big deal. And I know it is, of course. No parent wants to see their child faced with the obstacles a hearing-impaired child will face. And of course, there is and always will be, difficult times. But to parents who have recently been re-routed to my path, the one where you have one calendar just filled with audiology, therapy and doctors appointments, take heart. If it’s only hearing loss (and I do know that for so many, it is so much more), it’s one year of intensity, and then you will just get on with your lives. On a slightly different landscape. But it’s do-able. For myself, I find that I have been given a new filter to life. I can focus much more clearly on what is important and what is peripheral. People. Things. Experiences. Life. Would I choose this path? No, I wouldn’t choose to have a deaf child. But you know what, I am enjoying the journey. It’s different. It’s not what I planned. But it’s rewarding. It’s special and filled with love. And we are happy. It has been a while since I have written, and I think that reflects the fact that my life has moved away from being a mum of two children, one of whom is deaf, to just being a mum. Who knew ‘normal’ was so wonderful! I was reflecting on this yesterday when I took Henry to his weekly Baby-Gym class. When we started in the class, Henry was the only child who couldn’t walk (the class is for 18mon- 24mon, and Henry started walking only at 18months). So activities like running around a circle were difficult, despite Henry’s super-speed crawl! Henry had very limited vocab, so instructions from the teacher like “okay, everyone come and get two shakers from the box, one for you and one for mummy”, meant little to him, even if he had been able to hear the teacher properly above the background music and other children! However I wasn’t too worried about what the other kids were doing, and what Henry couldn’t do, I was doing the classes to teach Henry new things and expose him to different activities, and as long as he was progressing in his own way, and having fun, then that was all that mattered. Each week I patiently repeat each instruction from the teacher to Henry to ensure he has the language to go with each activity we are doing. And over the weeks I have seen his confidence blossom, in himself, his understanding of what is happening and in his abilities. Before we started the class I was worried that his CIs were going to keep falling off at inopportune times (like when he is demonstrating swinging on the bars to the class) – I didn’t want everyone to see him as the boy that needed these hearing aids that kept falling off- I just wanted Henry to be another little toddler trying to balance on the beam. I needn’t have worried- his headbands keep his CIs on so perfectly, they have only come off once, when he was being shown how to do a backward roll and very awkwardly got stuck halfway! Yesterday in class, just over two months after we started, he was running around with the rest of the kids, fighting over the balls and calling out ‘mama’ when he couldn’t see where I was. At one point the teacher asked Henry if she could help him do a handstand. He nodded and said “yes”, it was so cute. I know he didn’t really understand what she was asking, but he understood enough that it was question and Henry had to answer and that then he was going to do something with her. Henry is an individual, with his own strengths and weaknesses, but it is so nice to see him with other children his age and see that he is not missing out on anything, he can do everything they can do, it’s wonderful to see. Hearing Age = 7 months. The list reveals a little about Henry’s life too! He eats and sleeps. He reads books about animals. He pushes and pulls cars and trucks. And Mama drinks hot coffee!! Imogen is such a good big sister, always teaching Henry new words. Here she is commentating a movie to him. Notice how half way through she gets him to say "people", the first time he has said that! And here she is reading a photo book to Henry. From the moment Henry wakes up in the morning, til when he goes to bed at night, I talk; I commentate, I label, I read, I play games, I sing, I do not stop talking. I know that to have the best chance of developing speech and language, Henry needs to hear the language- often. But every afternoon we go to the pool for an hour. I take off his CIs when we arrive at the pool (which can’t get wet) and stop talking and it’s such a relief! I give myself, and Henry, a break, and just enjoy the water, the quiet. Although, my quiet is not the same as Henry’s quiet. Of course I wish with all my heart that Henry could hear at the pool, but I know how lucky we are that he can hear the majority of the time and it always makes me appreciate that a little bit more when I experience how difficult it is communicating with him without sound. People say to me, oh kids don’t need to hear at the pool, they just swim! But Henry can’t swim and I’m finding it quite difficult to teach him without the benefit of words. I sign ‘kick’ to him, and he signs it back, so proud, thinking that that’s the game- like giving high five, look, I can copy you. But I don’t want him to sign it, I want him to do it!!! Watching Imogen’s swim lesson yesterday, the teacher didn’t stop talking, kick your legs, face in the water, blow bubbles; all things I need to teach Henry somehow. But, you know, it’s just a small hurdle. Yes, it makes it a little bit harder, but some kids hate the water, every child needs to be taught in their own way, in the way that suits them best. And at the moment, I am not too focussed on the swimming thing. Right now I am just letting Henry enjoy the water, and allowing both of us to enjoy the break from my voice. My daughter will start school soon, and we are busy considering the different options we have for her. As we are in Dubai, we have to consider the curriculum we put her in (International, British or American) as well as a host of other factors. She is an incredibly bright, confident little thing and I know she will thrive in most environments. About six months ago I had a discussion with Henry’s therapist about pre-school options for him. Australia has some excellent pre-schools aimed specifically for deaf children learning to listen and speak and I wondered if we should start getting him enrolled in one of these. Melissa advised me that most likely Henry would be able to go to a ‘normal’ pre-school. At this point Henry had not yet been implanted, seemed worlds apart from hearing children, and while I found this encouraging, I wasn’t totally convinced. However now, six months on, Henry is progressing beautifully with his listening and speech and I have no doubt that he, like his sister, will be able to attend and flourish, at any school we choose for him. Henry’s hearing impairment, while still an important factor in any decision we make, not only about him, but about our family, is just one of the many issues that we consider. This week I hosted playgroup, attended by a diverse range of children; different nationalities, religions, backgrounds, parents, abilities, strengths, weaknesses. Every child comes to us with their own personality, and is shaped by their experiences. Amongst all these children, Henry was like every other child; unique. His deafness is part of who he is, but it doesn’t define him. I am a stay-at-home mother to two gorgeous children, Imogen (3 yrs) and Henry (10 months).